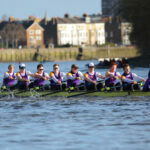 UL crews will be racing in the Visitors’, Prince Albert, Temple and Town Cups. With UL represented in three Great Britain composite entries. The University of London has a busy racing schedule. Two row overs also take place on Saturday, celebrating ULBC winning the Grand Challenge Cup in 1968 and UL & Leander Club winning the Grand in 1988. Both these crews went on to represent Great Britain at the Olympic Games. For a full list of UL races & entries, row overs and alumni events click here. UL are a Selected crew in both the Visitors’ and Prince Albert. The Visitors’ 4- raced at the Holland Beker last weekend, winning Gold in the M4+ on Sunday. 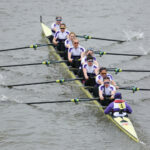 The UL entries into the Temple are the UL 2nd and 3rd Eights. UL’s 1st Eight was ineligible to compete in the Temple, after December’s rule change left our five U23 World Championship medalists unable to race. 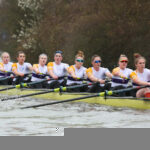 The GB U23 Women’s 2x, with UL U23 World Champion and Royal Holloway student Charlotte HODGKINS-BYRNE, is a Selected crew in the Stonor Challenge Trophy. The senior GB Women’s Eight and Four also race (both Selected crews), with UL athletes Matilda HORN and Sara PARFETT on board.